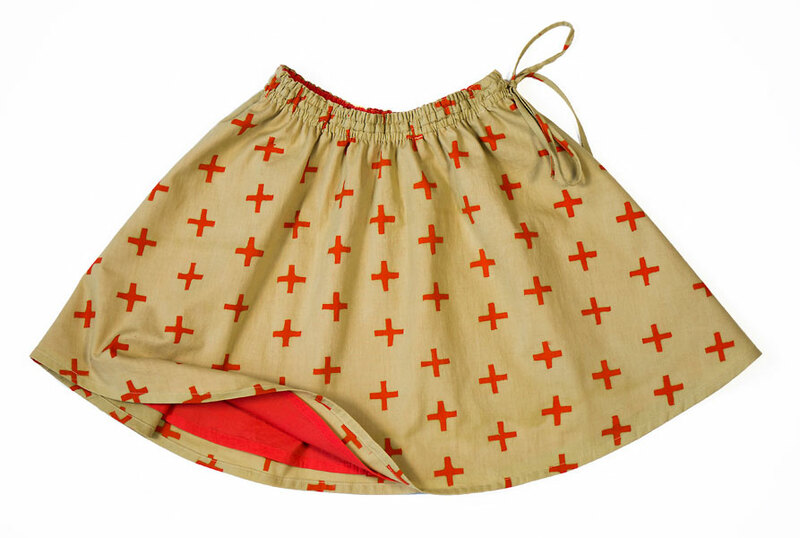 This simple, fully-lined skirt features two elastic casings and a drawstring that ties at one side. The flared shape will have girls of all ages twirling happily. For ease of use, this digital pattern has been made using PDF layers, allowing you to print only the sizes you plan to use. This style is provided as a digital pattern. It may be printed on both home printers (using either 8 1/2" x 11" or A4 paper) and at service bureaus that handle A0 or 36"-wide sheets. When you complete your order, you will be provided with a unique code to instantly download the pattern. See our digital product policy for full details. This digital pattern has been created with PDF layers. You may use this feature to print only the size(s) you desire. After successfully sewing this pattern, you will have developed the following skills: curved seams, gathering, and lining. Light- to medium-weight woven fabrics like cotton broadcloth, batiste, calico, lawn, linen, lightweight denim, chambray, seersucker, and voile. Coordinating thread, featherweight fusible interfacing, and one package of 1/4" elastic. Optional: 1 1/2 yards of 1/4" ribbon or twill tape for drawstring. Waist, Fully Extended * 24 1/2" 25 1/2" 26 1/2" 28" 29" 30"
Skirt Length 8" 8 1/2" 9" 9 3/4" 10 1/2" 11 1/4"
Waist, Fully Extended * 31" 32" 34" 35" 37" 38" 39"
Skirt Length 12" 12 3/4" 13 1/2" 14 1/4" 15" 15 3/4" 16 1/2"
I made this skirt with quilting cotton and a lawn fabric for the lining. Instructions were great and I modified the waist to use 1 inch elastic (that’s what I had on hand) my daughter loves the twirl effect on this skirt! I've made this skirt in a quilting weight cotton (8 years) and a tana lawn (2 years). What a great pattern. They both worked out a treat and I look forward to making lots more. I also added some tulle underneath them both as they were for Christmas/party skirts. 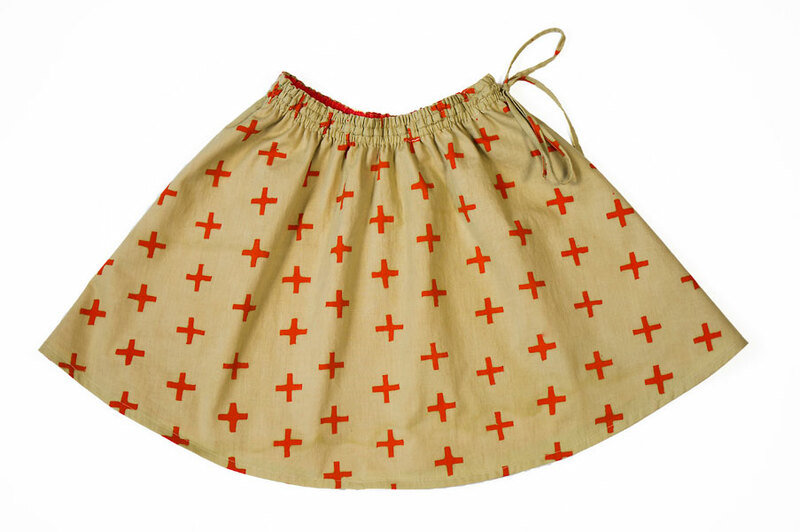 I ordered this pattern for my niece who has been taking sewing lessons at her church. She was ready to try something a little more advanced and wanted to try a pattern. She had a helping hand along the way, but was able to make a beautiful skirt that she loves to wear and tell people about. What a fun way to learn to sew clothes! I just finished my first Swingset skirts - size 12/18 months and 10. I used a quilting weight cotton with a lightweight cotton lining. I also left out the tie casing on the smaller size since some reviewers thought the band was a little wide on the smaller sizes -- but I think it would have been fine. I added a faux tie instead. I expect to be making many more of these cute skirts. 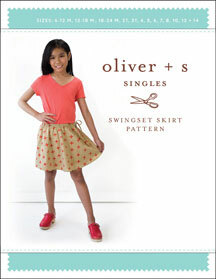 I recently sewed up the Swingset Skirt in a light/medium jersey knit for my tall & lean 11yr old granddaughter. The lining was a very lightweight woven lining fabric that had just a bit of stretch (fabric ? from my stash). The fabrics & pattern worked perfectly together to give the summery feel I wanted to achieve. I used the size 12 pattern & lengthened it about 1" as she likes to wear her skirts above the knee. For the drawstrings I bought 1/4" cording which added a bit of a modern, teen vibe to the look. She loves her finished skirt which made me a happy grandma. This skirt is drafted so well. I agree with other reviewers; it has just the right of fabric to create fabulous movement and shape. I made this (size 5) in a black japanese cotton with white cats on it and then used a white cotton with black polkadots on it for the drawstring. My grandaughter loves it! I made this skirt as part of a birthday present for my 4 year old daughter. Out of all the items, she picked this one as her favorite. It helped that the outer fabric was lace. To hide the elastic I made a facing for the waistband and placed the elastic and draw string between the inner skirt and the facing. The skirt came out a little short for our taste so next time we'll be extending the length a little. This is such a great skirt. Sizing was perfect and the skirt came together quickly. I also appreciated the ability to print the pattern on larger format paper. Great easy basic, fun to personalize! This is a fast sew with fun details and lots of room to play with fabric combos, trim, applique, and other details. 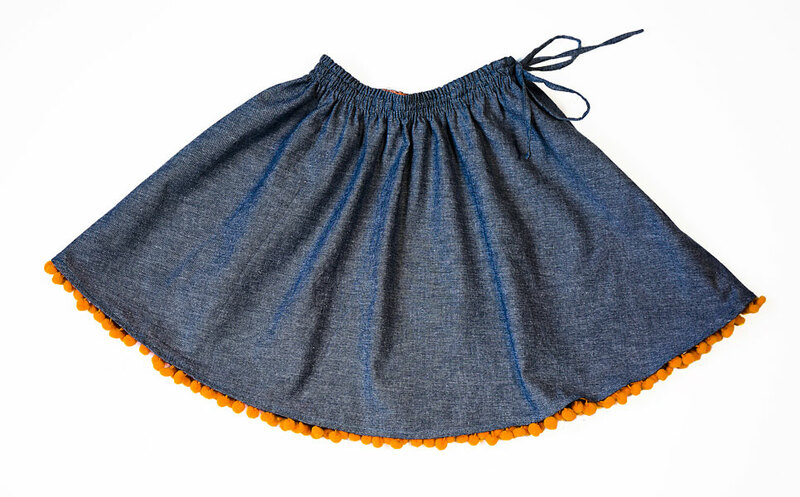 My 6yo loves the twirl it offers and the elastic + drawstring waistband looks adds some interest without detracting from ease of wear. Love that this one comes in a wide range of sizes! 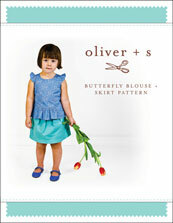 Deal all, this skirt is easy for a beginner (like me) and my grand daughter love it! Good to wear during our summer and all over the year! A very nice skirt, perfect instructions. 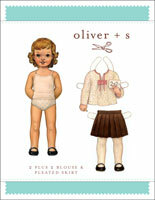 It is always a pleasure to do with Oliver + S patterns. Thank you! I've made a few skirts for my girls, but the details on this skirt are my favorite. It has just the right amount of fabric to make it twirly, but not so much that it is bulky. 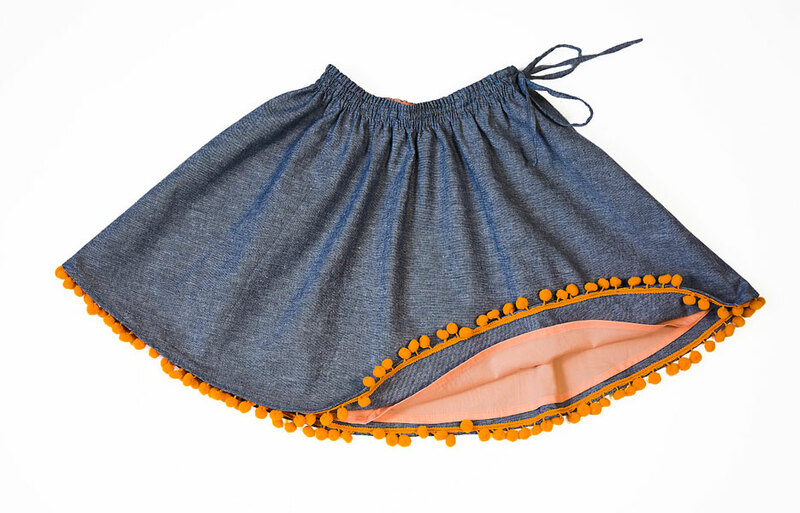 I like the smaller rows of elastic paired with the drawstring at the top. This eliminates the rolling that often happens with single rows of elastic. The built in slip makes it possible to use lightweight fabrics as well. I prefer the O+S paper patterns to the digital version I bought for this skirt, but I'll definitely be making more! A great skirt, excellent pattern. I've made a few for my daughter and niece in a range of fabrics - the latest was a black lining with black tule and sparkly stars for her cat dress up to go to a party. She loves it! With the double elastic and drawstring, the waist band is quite wide, probably too bulky for the smaller sizes but OK for the larger ones. I'm making a size 2 next so will just do a single band of elastic. Easy and well written. 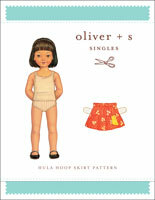 I am teaching my 9year old to sew and bought this pattern as a second project for her (first was the Popover Sundress). I love that every pattern teaches a specific sewing technique and not only how to assemble. Discussion on the digital swingset skirt sewing pattern from the Oliver + S Discussion Forums.